This is typical of a car that does lots of motorway miles. 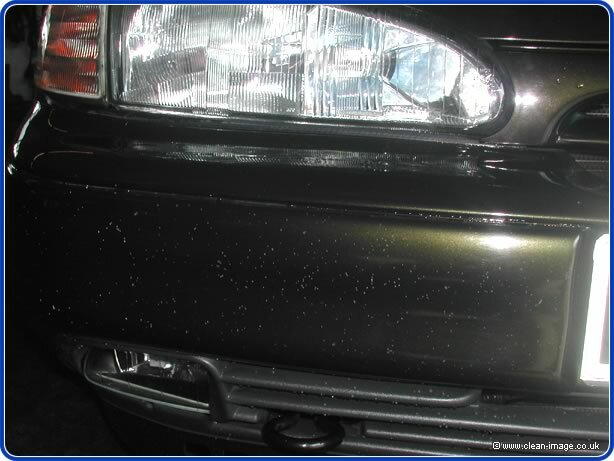 There are hundreds of stone chips on this plastic bumper which looks all the worse because the pale grey primer shows through and contrasts with the dark green paintwork. On the bonnet you can just see that there are larger chips that have exposed bare metal which will rust if not treated quickly. 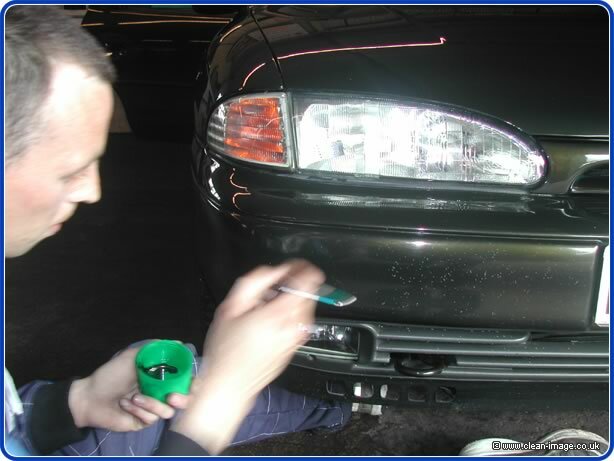 Sean is shown here touching in the bumper using a special artists brush which is resistant to the solvents in car paint. Most modern car paints have a satin finish and require a second coat of lacquer to achieve a gloss finish. This is not a problem with flat (solid) colours but Metallic colours can be a problem. For an exact colour match, the metallic particles need to settle and mix in the right way with the green pigment. So the thickness of the paint needs to be consistent, and the paint needs to dry in an even and consistent way. This can only be done with a spray gun. 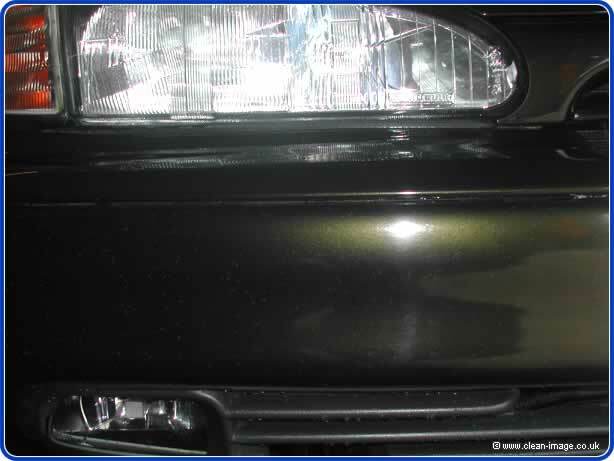 So to get an exact colour match on a car such as this, you would need to spray the stone chips once with the base coat, then again with the lacquer. Obviously, this would involve a huge amount of work and is impractical although we can do it if you really want! Instead of spraying the chips, we mix the base coat with the lacquer and apply it as one with a fine brush (and a very steady hand). It can still be a painstaking task taking hours but as you can see from the photograph above, it makes a dramatic difference. If you look very closely at this photograph, you can see the paint has dried slightly lighter where the metallic powders have separated from the green pigments. But this looks worse under the camera flashlight, and is really not very noticeable. To sum up, stone chip touch-ins is not an invisible repair, but it can improve the appearance of your stone chips by 60-90%. More importantly, it seals the chip against the elements preventing rust from setting in.